An out-of-service oil distribution and storage station (ODSS), which operated from 1966 to 2000 in Mexico, is contaminated mainly by gasoline and diesel, showing the presence of methyl-tert-butyl-ether, benzene, toluene, ethyl benzene, and xylenes. Nine of the 16 polycyclic aromatic hydrocarbons were found, as well as Fe, Pb, V, and Zn. The health risk assessment suggested the necessity of reducing of three PAHs [benzo(a)anthracene, benzo(a)pyrene, and benzo-(b)fluoranthene], and vanadium. 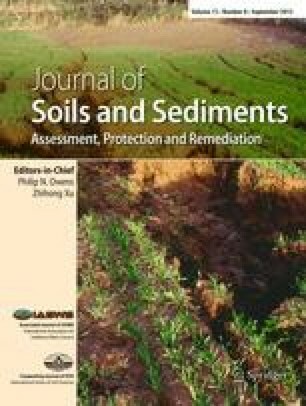 The aim of this work is to show that soil washing (on-site) and biopiles are excellent remediation methodologies to treat soils contaminated with petroleum derivates and metals. Applying them, it is possible to reach the goal value of 2,000 mg TPH/kg in a few months, as requested by Mexican legislation. More than 140 m3 were excavated from the ODSS. Three soil-washing dishes were built. 1540 m3 were treated by soil washing using a nonionic surfactant. A 100 m3 biopile was built to study the system capabilities in the biodegradation of around 4,500 mg/kg of TPH using the autochthonous microflora. The soil washing, average TPH-removal value was 83%, but values up to ca. 93% were observed. Removal values resulted in a function of the TPH initial values. Biopile (100 m3) worked during 66 days, reaching a TPH-removal value of 85%. At the end of the processes, no PAHs were detected. The contaminated soil was treated successfully, reaching the legislation limits (TPH values under 2,000 mg/kg, and a significant reduction in PAH concentrations). Both systems are suitable for remediation purposes, achieving high removal efficiencies at short and medium stages. It is highly recommended to proceed with soil washing studies, identifying new products, and mixtures, which could reduce costs and assure optimum operation.